Manila: Philippine journalist Maria Ressa, a prominent critic of President Rodrigo Duterte, was rearrested on Friday in what press freedom advocates called retaliation for her news site's dogged coverage of the government. The United States urged the Philippines to quickly resolve the case against Ressa and allow her and her news site Rappler to "operate freely." 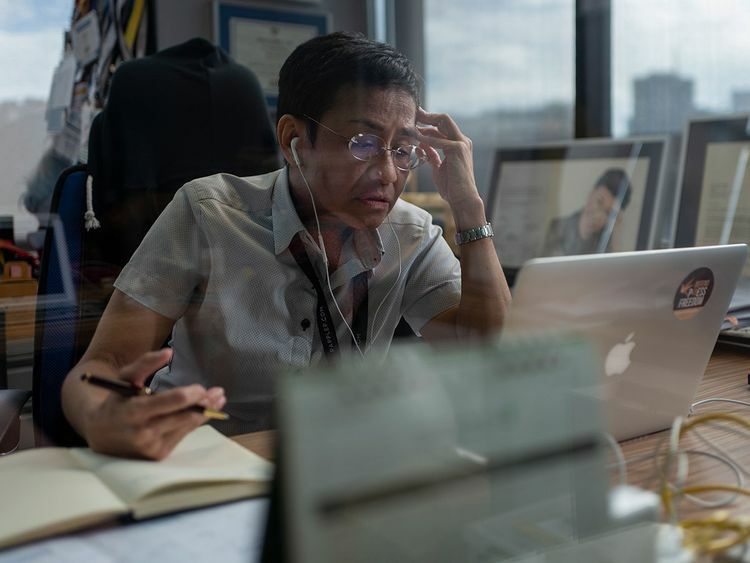 Ressa and Rappler have been hit with a string of criminal charges in recent months that have sent shockwaves through the Philippines' media scene, prompting allegations she and her team are being targeted for their work. The latest charges allege she and colleagues at Rappler violated rules on foreign ownership of media. She was taken into custody after arriving at Manila's airport from a trip abroad. "The press in this country is under attack... We won't take the threat sitting down," Ressa told reporters after her release on the equivalent of $1,700 bail. "The rule of law has been weaponised." Rappler has reported extensively, and unflatteringly, on Duterte's deadly narcotics crackdown that has claimed thousands of lives and which rights groups say may be a crime against humanity. A State Department spokesperson said the United States was "concerned" about Ressa's arrest and called on the Philippines to respect freedom of the press. "The freedom of expression is a cornerstone of any truly democratic society and a fundamental freedom recognised by both the United States and the Philippines," the spokesperson said. "Maria Ressa is a highly respected and experienced journalist. "We hope these charges will be resolved quickly, in a way that fully respects the freedom of expression, allows Ms Ressa and Rappler to continue to operate freely, and is consistent with the Philippines' tradition of a free and independent press." Philippine authorities first arrested Ressa in February on an internet libel charge, which sparked international condemnation and allegations that she was being targeted for Rappler's critical stance on Duterte. "This case against Ressa... is unprecedented and speaks volumes of the Duterte administration's determination to shut the website down for its credible and consistent reporting on the government," said Carlos Conde of Human Rights Watch. Rappler generally casts a critical eye on the president's leadership and his government, including the nation's deep-rooted corruption and Manila's moves to court Chinese trade and investment. But Duterte's anti-drugs campaign is his signature initiative and he fiercely defends it against criticism. Ressa insists Rappler is not anti-Duterte, saying it is just doing its job to hold the government to account. The country's corporate regulator revoked Rappler's business licence last year over the 2015 bond sale, but the site continued operating as it appealed the case in the courts. Last month, Ressa spent a night in detention after being arrested at her office but eventually posted bail for allegedly libelling a businessman in a news article written in 2012. Salvador Panelo, Duterte's spokesman, said the arrest was simply enforcement of the law and was not related to Ressa's work. "Press freedom has nothing to do with the charges against Ms Ressa," he told reporters. "She should concentrate on defending herself in court."